This article was originally written in two versions, one for use in Australia, one for use in America. These have been merged into a single article. As well as over 7 million pet cats, Britain has around 1 million feral cats. Strayed or abandoned pets, including pedigree cats, swell the feral cat population, presenting British animal welfare societies (humane societies, SPCAs) with a massive ongoing problem. The answer to this problem is not simply to kill the cats, but to curb the uncontrolled breeding and to promote responsible ownership of cats. Many people get pleasure from feeding feral cats, little realising that they are ensuring the survival of another generations of ferals. With no large predators regularly preying on adult cats, a large population of sick or malnourished ferals builds up. It is up to animal welfare societies and concerned individuals to stabilise a small, healthy feral population. Over the years I have been involved in this work and have studied feral cat control methods worldwide. Feral colonies are regarded with varying degrees of enthusiasm. Feeding ferals gives pleasure to some, but others want them exterminated. Under British law (a slight generalisation since laws differ in Scotland), feral cats are classed, and controlled, as vermin and legally belong to the person who owns the land the feral cats inhabit. The landowner can order them destroyed at any time. However, it is against the law to cause cruelty to wild or feral animals and if they are destroyed, they must be trapped and destroyed in a humane manner. The "wild cat" which is protected under law is the indigenous Scottish Wildcat (F silvestris grampia). Feral cats (F catus) are not accorded this protection - feral means a previously tame creature which has reverted to the wild state. When considering laws in Britain, do not confuse these very distinct meanings of "wild cat" and "feral cat". An additional problem is the growing vilification and scapegoating of cats in general. They are blamed for the loss of songbirds, when the prime cause of this is destruction of habitat by humans (farming, house-building and industrial use). It is far easier to blame cats than for humans to modify their own behaviour. Dog owners often revile cats because cats have more freedom to roam and dogs are supposed to be on a leash (in fact Britain has a stray dog population which many dog owners prefer to ignore) or because cats do not show mindless deference to their owners (Are Dogs More Faithful Than Cats?). They are blamed for tearing open bags of rubbish, although foxes, badgers and magpies are just as much to blame for this. A root cause of cat hatred, and of attempts to promote or incite cat hatred, is often the fact that people have contempt for what they cannot control - be it animals or other humans. This means that the perceived problem is much greater than the actual problem. This is further fuelled by poorly researched surveys which set out to prove a "researcher's" foregone conclusion by using inadequate and unrepresentative samples, e.g. the Mammal Society Survey (Domestic Cats - Wildlife Enemy Number One or Convenient Scapegoats?). Feral cats are wild animals. Some are abandoned pets; others are born in the wild to existing ferals or to strays. Kittens born in the wild, with no exposure to humans during the socialisation period (3-8 weeks) become wild animals. Many ferals approach familiar people for food and some become tame through regular contact, or are tamed by carers. Farm cats (barn cats) are often considered to be "semi-feral" or "semi-tame" since they are accustomed to some (albeit limited) interaction with humans. In Scotland, feral cats have hybridized extensively with the indigenous Scottish Wildcat (F sylvestris), creating mongrel wildcats, including the large, black wildcat hybrids known as 'Kellas cats' or 'Moray cats'. In fact, according to some researchers, traditional conservation efforts to protect the "pure" Scottish wildcat may be misguided. It has interbred with domestic cats for around 2000 years, so long that it no longer makes sense to preserve it as a separate pure-bred species since gentic tests put its purity in doubt. They argue that the replacement of wildcats by more adaptable hybrids is evolution in action. Although wildlife groups will disagree, some researchers argue that the pure wildcat should only be protected if it plays an important role in the local ecosystem. Hybridization of domestic cats with wildcat species to create new breeds could lead to an inufusion of wildcat genes into the feral population of Britain. 90% of domestic cats are indoor-outdoor pets and up to 20% of tomcats are non neutered; and rescue shelters encounter pedigree cats which have gone feral after straying or being abandoned. I have encountered a completely feral Persian and knew of an unneutered Persian tomcat living wild. The owner considered this to be a natural lifestyle for her cat, despite the fact that Persians are a far cry from their wild ancestors. I have heard of a Blue-point Birman gone feral and breeding, and of rogue breeders with "colonies" of never-handled Burmese and Siamese cats whose unsocialised kittens are sold as pets. One irresponsible breeder/owner dumped over 20 purebred white Persians in woodland to fend for themselves. Abandoned cats, will often join feral colonies, attracted to whatever food source is maintaining the feral colony. 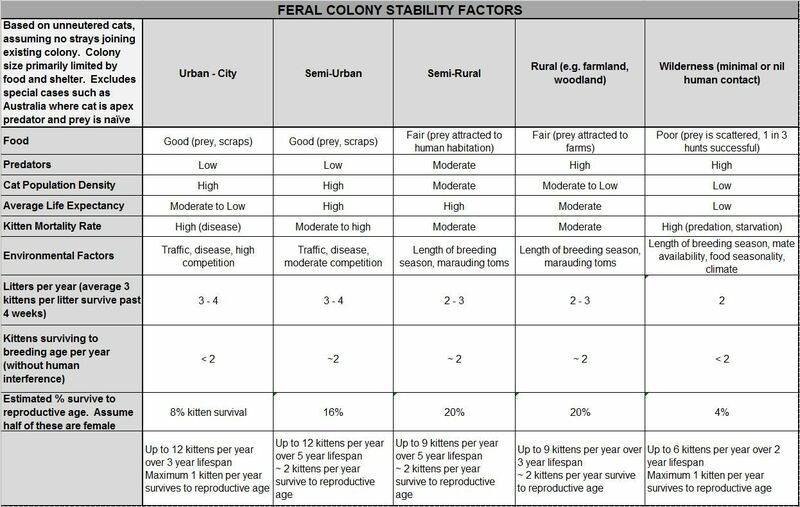 The diagram shows how unneutered pets, strays and ferals interact to contribute to the feral population and how neutering helps break this cycle and limits feral populations. In parts of the world, feral colonies are poisoned with strychnine (e.g. in Greece, Greek Islands, Tunisia, Turkey), cat-specific toxins (FTC2 in Australia) or deliberately infected with feline pathogens such as cat flu or enteritis (distemper). While visiting rural France, I was horrified to find my host laying poison specifically for feral cats and kittens. He considered himself a cat-lover and owned Siamese cats. It emerged that neutering cost the equivalent of US$200 so many owners didn't bother. Rat poison is cheaper. In some areas, ferals can be controlled by contraception in their food, with the risk of cats feeding elsewhere and not receiving the correct dosage. Elsewhere cats (ferals or pets) are shot indiscriminately, trapped or snared, hunted with dogs or clubbed to death (wild kittens, cornered adults). However eradication is neither feasible, nor is it the answer (Feral Cats - Extermination is not the Answer). In Britain, deliberate poisoning of feral cats is not normally allowed as it puts wildlife and other domestic animals at risk. There have been cases of deliberate poisoning with rodenticide, but the use of poison is strictly controlled. There is the risk of scavengers ingesting the poison when eating carcasses. Harmless insectivores such as hedgehogs are particularly at risk from cat food laced with poison. Deliberate infection with cat flu or enteritis is also unacceptable. Contraception has sometimes been used as a short term measure prior to trap-neuter-release (TNR) schemes. Because they are classed as vermin, feral cats ("nuisance cats") may legally be controlled by shooting by the landowner or his agents. They many also be live-trapped (using human box traps) and euthanized. More rarely, a feral cat is shot by a trained pest control operative because it is untrappable and there is no safe alternative. One factory employed a Pest Control Agency to exterminate a feral cat colony. In 3 weeks, only 2 feral cats were trapped and destroyed - costing the factory the equivalent of US$1500. Had the factory been willing to maintain neutered ferals, a cat rescue group would have trapped, neutered and returned them for the price of neutering surgery (although US$750 per cat would not have been refused!). Some land-owners take the law into their own hands, using leg-hold traps (illegal in Britain), crossbows, poisons or snares. Most of these methods are indiscriminate, killing pets and wildlife as well as the feral cats. In 2000, a British man was convicted of killing neighbours' pet cats using sardines or pilchards laced with cyanide; over several years, he succeeded in killing scores of pets before being caught and had enough poison to kill hundreds more. People who take the law into their own hands risk conviction under animal cruelty legislation, but humane societies still see far too many cats which have lost legs in steel-jaw traps or who have cross-bow bolts embedded in them. The perpetrators are rarely caught. At my local cat rescue shelter, we had two three-legged ferals living in one of the large enclosures. One (front leg amputee) had been found raising kittens despite severe injuries and the other, a male, had a leg partially amputated by an illegal trap. A pet cat lost a front paw to an illegal trap, but could not have the leg fully amputated because a back leg was mummified, possibly due to loss of blood supply to the limb (miraculously, the cat survived the leg mummification without succumbing to blood poisoning). Badly injured ferals, or those too wild to be retired to a captive colony, must be euthanized. Many more die of trauma or blood loss (sometimes having lost the limb first) or are killed when the trap is checked (stamping being one method of dispatch). 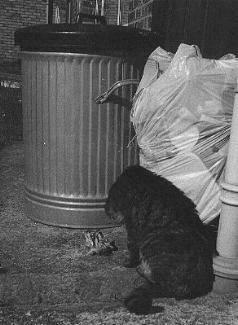 Public opinion is generally against the wholesale destruction of ferals. For a start, vacated areas simply attract new cats. Also, there is a risk that indoor-outdoor pets may be caught up in the destruction. One of my colleagues lost her cherished elderly pet when it was mistakenly identified as a feral and destroyed. Since the frightened cat tried first to escape from, and then to bite, the SPCA officer, it was assumed to be feral. Most feral feeders welcome trapping and neutering since they see so many cats die young. Other are hostile to the schemes as they enjoy seeing the kittens (90% of which die in their first year) or they believe that neutering is unnatural and that the cats will become less effective hunters. In a few cases, the opposition to neutering is on religious grounds. The fact that ill or injured cats must be euthanized is a particular sticking point in predominantly Muslim areas of British towns. Only God may take a life and where there is a chance that cats will be put down, the whole TNT operation may be viewed with hostility (occasionally traps have been sabotaged). Neutering itself may or may not be permitted intervention depending on one's interpretation of one's religion, Muslim, Christian or otherwise. Modern methods of control involve creating smaller, stable colonies. If the colony is too small there will be food surpluses (of whatever attracted the feral cats to the area in the first place) and new cats will be attracted into the area. Overcrowded colonies are unhealthy and may fragment. Sick, pregnant or maimed cats are always given priority when trapping. Lactating females may be re-released unless the kittens can also be trapped. As many ferals as possible are neutered and returned to site, or to a suitable alternative site (with the agreement of the site owner). These are similar to Trap-Test-Vaccinate-Alter-Return (TTVAR) schemes in America. There are limited trap/desex/return-to-site in Australia where the cat has a greater impact on wildlife than do feral cats in the UK. Vets are forewarned that the cats are wild and the person or group running the TNR scheme must usually provide any post-operative care. Local residents are warned to confine, or put collars on, pet cats while feral-trapping is in progress. While being neutered, feral cats are often ear-tipped in order to make them identifiable from a distance. The tip of one ear is cut off while the cat is under anaesthetic for neuter/spay surgery. Most cats are returned to site within 2 days, thanks to dissolving stitches, although aborted females must recuperate in a secure pen for several days. Females with litters are problem as they can't be separated from their kittens for too long. Volunteers have climbed drainpipes, crawled under sheds, burrowed in compost heaps and wood-piles and crawled through undergrowth in search of kittens. Feral kittens are uncooperative when found and many feral-catchers have long and interesting tales about their many scars. Flank-spaying is preferred in Britain as there is less danger of the incision tearing open (with gruesome results). In abdominal spaying, gravity causes the contents of the abdomen to exert pressure on the spaying wound with a greater likelihood of rupture in this type of spaying. There may be fears that people will mistake flank-spayed cats as being ill and will attempt to catch them, chase them off or even kill newly spayed cats. Very rarely is abdominal spaying used: if the cat must be aborted or where it is necessary to hide the spay wound from people (occasionally one or two people may object to the colony being neutered while other feral caretakers are in favour of it, 'secret spaying' is sometimes authorised by the pro-neutering parties). Feral females are almost permanently pregnant. A few vets refuse to spay a cat until her kittens are 12 weeks old and fully weaned. Where ferals are concerned, this approach is disastrous as the cat will be pregnant again and the vet may refuse to abort her. One rescue society reported a pregnant 20 year old (older cats remain fertile although litters may be smaller). Abortion prevents us from keeping ferals in captivity to raise kittens. A great deal depends on whether the cat can be immediately returned to site or whether she must be kept in an enclosure (if the shelter has an enclosure) until she can be relocated. Where I volunteer my services, we have kittening sheds in a quiet part of the shelter (no public access) and ferals close to term are allowed to raise their kittens providing mom cat is healthy and if she is not so freaked out that she spontaneously abort or will eat the kittens. Most prove to be excellent mothers and the kittens grow up tame through regular contact with humans. Some rescue societies maintain that there are too many kittens being born already and they euthanize newborn feral kittens (this also allows the female to be spayed and released as soon as possible). Others maintain that kittens always find homes and they do not abort pregnant cats or euthanize kittens. With an estimated 40,000 unwanted domestic cats and kittens being destroyed each year in the UK it is a precarious balancing act and much depends on local conditions. Neither approach is wrong. What is important is that the chosen approach be implemented humanely. destroyed by humane societies - it is reported that in some years the UK's RSPCA destroy 30-35% of cats taken into their care. destroyed by vets because they could not be found accommodation at a cat shelter. pets which are deemed unhomeable: age, minor disability (e.g. cerebellar hypoplasia/"spastic") or controllable medical condition (e.g. daily medication). There is a grey area regarding cats with treatable injuries or conditions whose owners request euthanasia due to cost of treatment since this reason may be either genuine financial hardship or simple unwillingness to spend money. There have been reports or instances where nervous domestic cats have been redesignated as feral or unhomeable or relatively minor disabilities/conditions have been exaggerated in order to keep healthy pet cat euthanasia figures artificially low. Where there are extremely low figures for healthy pet cat euthanasia, the figures for feral cats and untreatable/unhomeable cats should be interrogated for a corresponding increase in these figures i.e. euthanized cats recategorized for public image purposes. Testing for FeLV/FIV is expensive in the UK and many animal welfare groups can only afford to test those cats which look ill or which give cause for concern. Infected ferals are euthanized to prevent the spread of disease to other cats and to prevent their own suffering later on. Undoubtedly some healthy-looking ferals are carriers, but there simply isn't the money to permit routine testing, let alone vaccinations. Some rescue groups destroy cats which have ringworm since prolonged captivity and treatment could prove stressful to the cat as well as costly. Will in care, the cat may lose its place in the colony. A decade or so back, a humane society euthanized what appeared to be thin, mange-ridden stray cat. They later discovered that they had destroyed a healthy, pedigreed, Cornish Rex. Deformities are common in inbred colonies, but not all cats have such serious deformities that euthanasia is required, especially since neutered cats cannot pass on hereditary deformities. All parties involved with the feral colony must be advised about the cat's condition. Again, there is a risk that people may see it arrange for the 'injured cat' to be destroyed, One dwarf feral became a great favourite among the colony's feeders. Deformed or spastic (cerebral palsy) kittens are most often born after outbreaks of infectious disease. Kittens with poor motor control are unlikely to survive, even in a managed colony, and should either be tamed if they are suitable for rehoming or euthanized to prevent suffering later on. 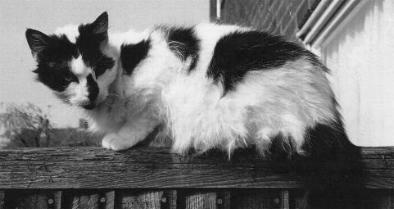 "Scrapper" was trapped aged 10 years and aggressive, but became a very affectionate pet. "Aphrodite" was tamed at 5 months and become loving with her whole family and with house guests, yet "Tabs" tamed at the same age, trusts only his tamer. "Sapphire" was hand-reared from a few weeks old but retained semi-feral tendencies. "Jade" was untameable at 4 months, but 10 months later she walked into a house of her own accord and became a lap cat. Healthy untameable ferals must be released, preferably at their original site. Often feral trapping takes place because the site is about to built on or the cats are simply unwelcome. In these circumstances, many rescue groups euthanize the wilder cats rather than neuter them and keep them captive until a suitable site can be found. Young cats are easiest to resite, although we have relocated 12 year old ferals with sympathetic farmers who expect the cat to be ornamental rather than functional (they simply like having a cat around the place and will provide food and water, but they don't want a house-pet). Where I volunteer, we are able to keep a limited number of feral cats in large enclosures until a suitable site is found where they will be fed and have shelter. We have some success establishing pairs or small colonies at riding stables and farms. Releasing ferals at unmonitored sites constitutes abandonment and is illegal under English Law. Cats are resited in pairs or threes and are confined to a secure barn or cage for 2 weeks until they recognise the scents and sounds of their new home. Colonies are usually limited to a maximum of 6 cats although some large sites can support multiple colonies. Even virtually self-sufficient cats must be monitored and kept healthy. Carers administer wormer in cat food and dust flea powder onto bedding. Regular carers are familiar with their cats and can readily identify new arrivals which may require neutering. The carers also record any births (to new cats or cats which have not yet been trapped) so that moms and kittens can be trapped. They look out for cats which are sick or elderly and which require either treatment or euthanasia. Only rarely can ferals be retired to an enclosure; in most cases it would be cruel and unfair to the cat. Even ferals need a dignified end. A number of British animal welfare groups run TNR schemes and numerous individuals or groups of friends are involved with TNR of individual colonies. However, and equal number of animal "rescue" societies euthanize any ferals presented to them, viewing them as an unrewarding drain on their resources. In addition, some societies or individuals cannot come to terms with the concept of cats as wild animals and euthanize healthy feral cats simply "to save them from their predicament" despite the fact that the cats concerned know no other way of life. Those who support the latter opinion claim that life in the wild is "short and brutal" and that it's more humane to kill the cats. This is a clear case of being unable to understand that not all cats are house-pets since they do not apply the same arguments to the rest of Britain's wildlife. TNR is well established in Britain and is used successfully in many places where the cats do not, of themselves, constitute a nuisance to humans.